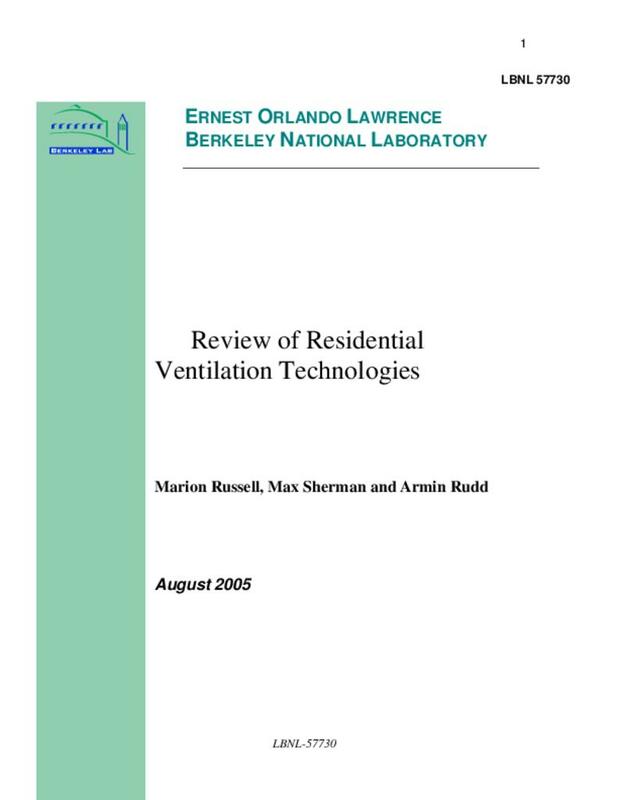 This guide reviews current and potential ventilation technologies for residential buildings with particular emphasis on North American climates and construction. The major technologies reviewed include a variety of mechanical systems, natural ventilation, and passive ventilation. Key parameters that are related to each system include operating costs, installation costs, ventilation rates, heat recovery potential. It also examines related issues such as infiltration, duct systems, filtration options, noise, and construction issues. This report describes a wide variety of systems currently on the market that can be used to meet ASHRAE Standard 62.2. While these systems generally fall into the categories of supply, exhaust or balanced, the specifics of each system are driven by concerns that extend beyond those in the standard and are discussed. Some of these systems go beyond the current standard by providing additional features (such as air distribution or pressurization control). The market will decide the immediate value of such features, but ASHRAE may wish to consider related modifications to the standard in the future. The purpose of ventilation is to provide fresh (or at least outdoor) air for comfort and to ensure healthy indoor air quality by diluting contaminants. Historically people have ventilated buildings to provide source control for both combustion products and objectionable odors (Sherman, 2004). Currently, a wide range of ventilation technologies is available to provide ventilation in dwellings including both mechanical systems and sustainable technologies. Most of the existing housing stock in the U.S. uses infiltration combined with window opening to provide ventilation, sometimes resulting in over-ventilation with subsequent energy loss; sometimes resulting in under-ventilation and poor indoor air quality. Based on the work of Sherman and Dickerhoff (1998), Sherman and Matson (2002) have shown that recent residential construction has created tighter, energy-saving building envelopes that create a potential for under-ventilation. Infiltration rates in these new homes average 3 to 4 times less than rates in existing stock. As a result, new homes often need provided ventilation systems to meet current ventilation standards. McWilliams and Sherman (2005) have reviewed such standards and related factors. According to ASHRAE standard 62.2-2004, published by the American Society of Heating, Refrigeration and Air-conditioning Engineers (ASHRAE, 2004), single, detached residential buildings are required to meet a whole house ventilation rate based on the number of bedrooms in the house, the number of occupants, plus an infiltration credit (3 cfm per 100 sq. ft plus 7.5 cfm per additional occupant which includes a 2 cfm per 100 sq. ft allowance for infiltration). There are a variety of ways to meet this standard either through mechanical systems or via natural forces. Not detract from the safety and durability of the house." The effects of incidental ventilation provided by infiltration and operable windows are discussed. Finally, a variety of factors that can affect the ventilation effectiveness are discussed in the third section including cost and energy use, air cleaning and filtration, construction quality, control systems, and duct systems. There are a variety of mechanical whole-house ventilation systems including exhaust, supply and balanced systems. Any of these may be in continuous operation or operate intermittently, they may be single-port or multi-port, or the system may be integrated into an existing HVAC system. Mechanical ventilation strategies provided more uniform ventilation rates than natural ventilation (Hekmat, Feustel and Modera, 1986). Properly designed mechanical systems provide good control over ventilation rates when compared to most other ventilation systems; however, additional energy is required to operate the system. Holton, J.K., M.J. Kokayko, and T.R. Beggs (1997) compared ventilation systems in new production built homes and found infiltration rates ranging from 0.1 to 0.07 air changes per hour in the summer and 0.35 to 0.15 ACH in the winter. As a result, they recommend modern houses include a mechanical ventilation system. Researchers have studied various configurations of exhaust, supply, and balanced ventilation systems, with and without whole-house re-circulation by the central heating and cooling air handler fan. A continuous whole-house exhaust system provides ventilation by using a single-point or multi-point central fan to remove air from the building (Concannon, 2002). Supply air enters the building envelope through gaps or provided vents (see Figure 1). If the building envelope is tight, there is a possibility that negative pressure can be created inside the building leading to back drafts from combustion (open flue) appliances. Often these systems incorporate a pressure relief damper to alleviate pressure imbalances. Supply air enters the building in an uncontrolled manner and may be pulled in from relatively undesirable areas such as garages, musty basements (or crawlspaces) or dusty attics (Barley, 2002). Whole-house exhaust systems may not be appropriate in areas where levels of outside environmental contaminants are high. In the case of radon, researchers have found that exhaust systems may actually increase the indoor levels of contaminants. (Bonnefous, Gadgil, and Fisk, 1992). In severe climates, very cold supply air may create drafts, while in moist humid climate zones, exhaust only systems can cause moisture damage to the building structure. Filtration cannot be sensibly added to an exhaust only ventilation system, unless one considers the building envelope as part of the filtration system. Heat recovery can be added to exhaust systems. Passively, the building envelope itself can provide some heat recovery (Walker and Sherman, 2003), and is also partially effective at removing ozone. More actively, an exhaust air heat pump can be used to recover the energy in the exhaust air stream. The Home Ventilating Institute(HVI) lists a large variety of fans that can meet current ASHRAE standards for ventilation rates if properly installed. However, several factors (such as the tightness of the building envelope, size, quality of ductwork, and placement of ducting, among others) can have a significant effect on whether the installed fan can provide the indicated ventilation rate. These fans can potentially provide ventilation rates from 50 to over 5000 cfm. Most of the operating costs result from conditioning the supply air rather than the energy to operate the fan. The HVI directory lists the energy use for only a small percentage of the fans, with typical power consumption of about 3.5 cfm/W. Wray (2000) found that from most perspectives exhaust-only mechanical ventilation systems are the most inexpensive of mechanical systems to operate. Figure 1: Mechanical exhaust system with supply air entering through the building fabric in an uncontrolled manner. A single point exhaust system is often an upgraded bathroom fan (e.g. Figure 2). Construction and installation costs are the lowest of mechanical systems. (Concannon, 2002) Only one fan and possibly some simple ducting are required to exhaust the air to the outside. In some cases, the fan can be installed in an exterior wall eliminating the need for extensive ductwork. Single-point ventilation systems suffer from a non-uniform distribution of fresh air especially to closed rooms. (Rudd, A. 2000.) In an evaluation of five mechanical ventilation systems, Reardon and Shaw (1997) found local exhaust only strategies that depended on kitchen and bathroom fans to provide whole-house ventilation provided only marginally better performance than infiltration alone. This simple system suffered from a poor distribution of supply air; the lower room received all the supply air while the upstairs rooms (bedrooms) did not receive enough air to meet the applicable ventilation code. Standard 62.2, however, has no distribution requirement; so this is not an issue for a minimally compliant system, but it is nevertheless a consideration. Figure 2: Example of a single-point local exhaust system with makeup air inlets (Oikos Green Building Source, 1995). Air inlets are needed only for tight building envelopes. Multi-point exhaust systems are an improvement over single-port exhaust systems in that they improve the room-to-room uniformity of the whole-house ventilation, but there is the extra cost of installing the ductwork (Rudd, 1999). One exhaust fan is ducted to many rooms of the house and may be remotely installed to reduce noise levels. In a comparison of ventilation systems, Reardon and Shaw (1997) found that if a centralized exhaust system is used with pick-up grilles in each room of the house instead of a local exhaust system, air was distributed evenly throughout the house even to closed bedrooms. An intermittent exhaust system is installed similar to a continuous exhaust system; generally it consists of one central fan to remove stale air from the building, but may also incorporate several fans in areas of high sources (i.e. bathrooms and kitchens). In this case, the fan(s) runs only part of the time at a higher rate and are sized to provide the necessary ventilation. The rate of ventilation when the system is operated intermittently must be larger than if it were operating continuously (Sherman, 2004). There are several advantages for using intermittent ventilation systems. The occupant can reduce the amount of outdoor air entering the building during periods of the day when the outdoor air quality is poor. Peak load concerns may make it advantageous to reduce ventilation for certain periods of the day. When the ventilation system is integrated with the heating and cooling system, cyclic operation may also make more sense. A timer can be used to control the fan which usually has a switch for the occupant to turn on when needed. The disadvantage here is that the occupant controls the ventilation and . . .